Ideal for sealing plastic bags of virtually any size and length. 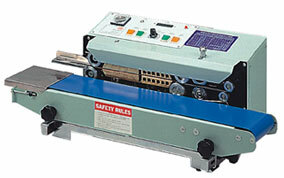 The variable speed conveyor belt is adjustable to accommodate most packages. It is equipped with a temperature control to adjust the heat to seal bags of various thickness. Equipped with a hot stamp imprinter allowing the user to record dates and codes with each seal. Included is a tool box containing spare bands, heater tubes and complete set of type. Conveyor and head can be raised or lowered and tilted to accommodate most projects. Smooth rolling and locking wheels. This versatile portable horizontal band sealer is virtually the same machine as the one listed above but is one quarter the size. This unit is ideal for projects which require higher production rates and minimal space and costs. Capable of sealing headers and bags simultaneously, Conveyor speed 0~50 ft. per minute, material thickness up to 20 mil and unlimited length. You can adjust the position of the seal, the height, depth, and angle of the conveyor and also emboss alpha numeric information on seal as an option. The AIE-B6201 comes equipped with speed temperature controls, embossing wheel, cooling fan and repair kit. Printing wheel and type optional. 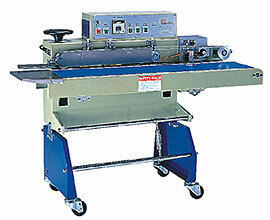 The vertical band sealer has same features as model AIE-B6201 except bags are sealed in a " standing position ". This method of sealing is ideal for the packaging of bags containing spill able items such as powders, liquids, grains, etc. Headers and base can be sealed simultaneously. Conveyor speed up to 50 ft. per minute. Unit can also imprint as well as seal. 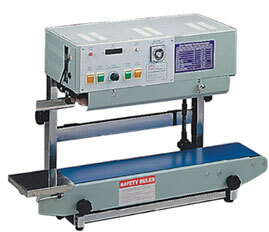 The AIE-B6202 portable band sealer is completely adjustable for height, heat and speed. Comes equipped with a repair kit. Embossing printing wheel and set of type optional.